For the first time, we are testing a 21:9 34-inch monitor that has AH-IPS panel and 144 Hz maximum refresh rate. 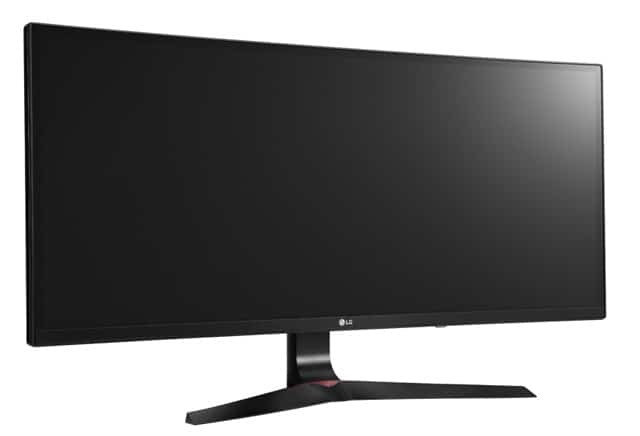 Combined with a native resolution of 2560×1080 and AMD’s FreeSync, LG’s 34UC79G-B is designed for smooth high frame rate gaming experience without screen tearing and with accurate colors thanks to IPS panel and factory calibration. The timing to do this test was perfect since we are not yet drowning in 2017 television reviews and there was free Overwatch weekend just when we got the monitor. Read on to find out what we have discovered during the test. At the time of publishing, price on 526,93 EUR on Amazon DE and 479.99 GBP on Amazon UK. Click the links for the actual prices. 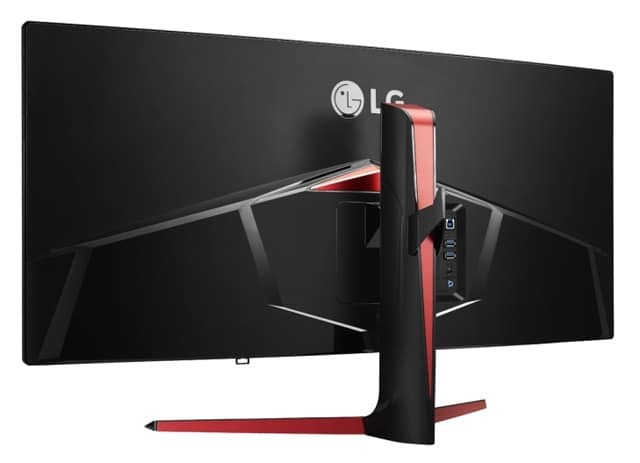 LG 34UC79G monitor features all black design with a touch of red on cleverly selected areas just to remind a curious spectator that this indeed is a gaming monitor. It is not designed to show off its gaming orientation from every corner as is the case with ASUS PREDATOR or AOC AGON monitors, but to impress with its sheer size and clean looks. From the active part of the screen up to the edge of the bezel is around 14 millimeters which is small enough to make the bezel around the screen slim and inconspicuous. The bezel is also clear from unnecessary stickers or markings, except for the LG’s logo on the bottom bezel (without the backlight). Matte plastic bezel continues on the back side of the monitor, except for the addition of glossy surface in the bottom area. Thickness is from 20 mm in the top area up to 55 mm in the bottom area. There is no wall mounting option so you have to use supplied stand which we like for several reasons. Apart from an interesting design which resembles of the horizontal stabilizer wings of an airplane, the stand allows for a tilt and height adjustment which is always a plus. The height adjustment of a total of 120 mm range is especially important for pleasant usage – something that we were missing a lot on previously tested Philips Moda 245C monitor. There is also a basic cable management system realized by a V-shaped clip which can also double as a headphone holder. The stand’s functionality is excellent and same goes for its build quality. 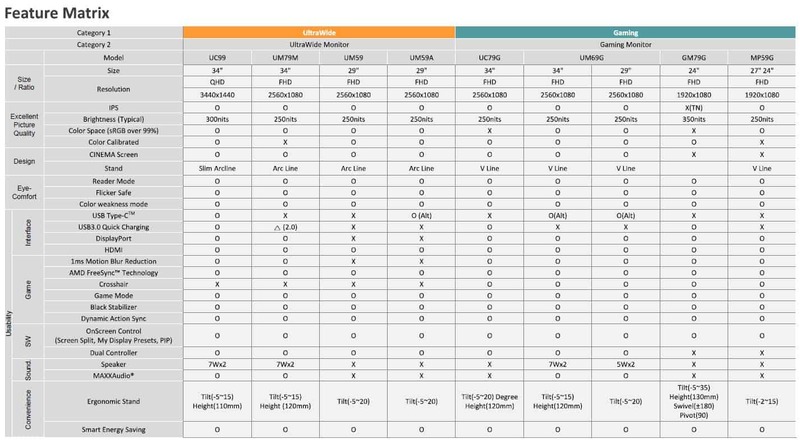 34UC79G features 2 HDMIs, 1 DisplayPort, 1 USB 3.0 upstream and 2 USB 3.0 downstream connectors, together with line and headphone 3.5 mm jacks. There is also a DC-IN. Quick Charge option for USB connectors is also available, though you need to enable it in OSD menus. 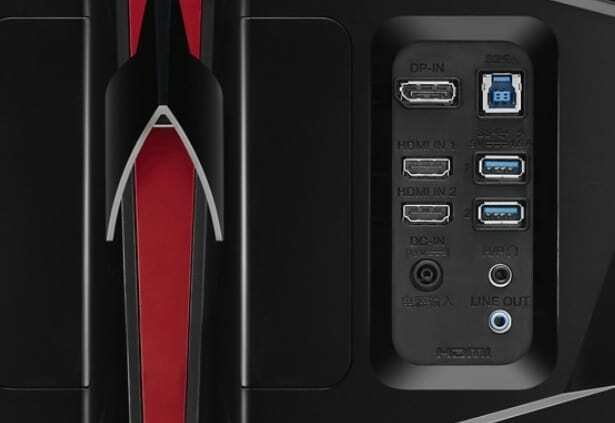 There are no built-in speakers but you have an option to connect headphones or external speakers and use the sound that is coming in the monitor through HDMI or DisplayPort connections. The good news is that both HDMI and DisplayPort cables are supplied so you do not need to consider an extra cost. The menu system is realized with an OSD menus which are accessed using a jog dial right beneath LG’s logo. Pressing the button will open a circular menu with an access to power off, input selection, game sub-menu and full menu. The Game sub-menu offers a selection between several Game modes, Black Stabilizer intensity, FreeSync, 1ms Motion Blur Reduction and Response Time options. A bit confusing is that part of those settings are also available in Picture > Game Adjust menu, but in the latter, you will find one additional option called “Cross Hair” that displays one of 5 different crosshairs in the very center of the screen. An interesting feature that might be useful if a particular game does not offer cross hair you want, but low resolution and pink/red color will probably reject many from ever using it. The menus response quickly and navigation is smooth thanks to the jog dial. In this segment, we go through factory picture quality (colors, contrast) and results obtained after calibration. Calibration was conducted using SpectraCal CalMAN 5 Ultimate for Business software and C6 colorimeter. 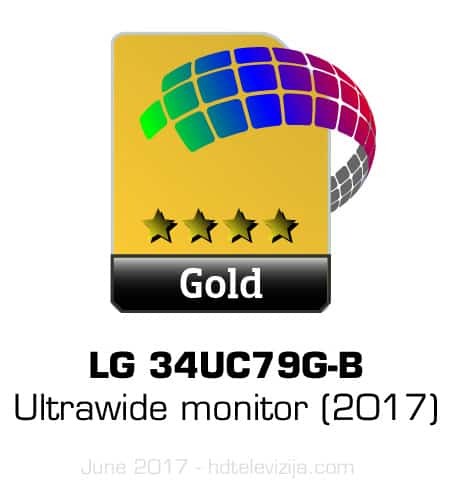 According to the piece of paper inside the packaging, LG has gone an extra mile to calibrate 34UC79G-B before it was shipped. Just like before, the report is a bit mysterious as it doesn’t specify which picture preset is actually calibrated so the only way to find it out is to measure each of them. According to our measurements, calibrated picture preset is called “Custom” and is activated by default. This means that the first picture you will see is actually the closest one to the reference values in terms of gamma, greyscale and colors. If only such scenario would become normal in the TV world where even the most expensive TVs come very poorly set unless you play around with the settings menu. 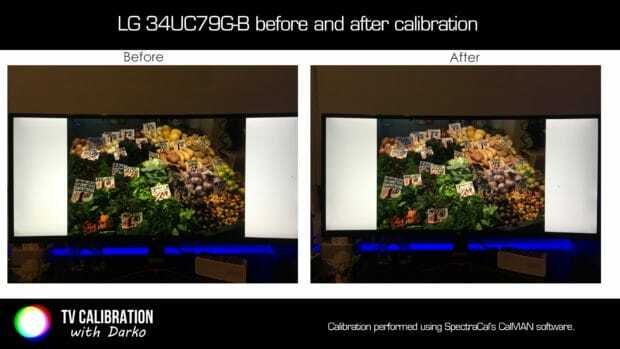 Despite the display being calibrated in the factory, we expected more from color accuracy. ColorChecker revealed average deltaE 2000 error of 6.98 with the maximum of over 10 (calibrated state is considered to be below 3). sRGB coverage was only 95.6% because of the primary colors being moved from their targets, especially green which lacked blue component. The Same lack of blue is visible in yellow, which makes people faces, fruits and sand to appear more yellow/orange than it should. Together with not perfectly accurate colors, gamma was also not fully according to sRGB definition, leading to the loss of details in dark areas of the picture. 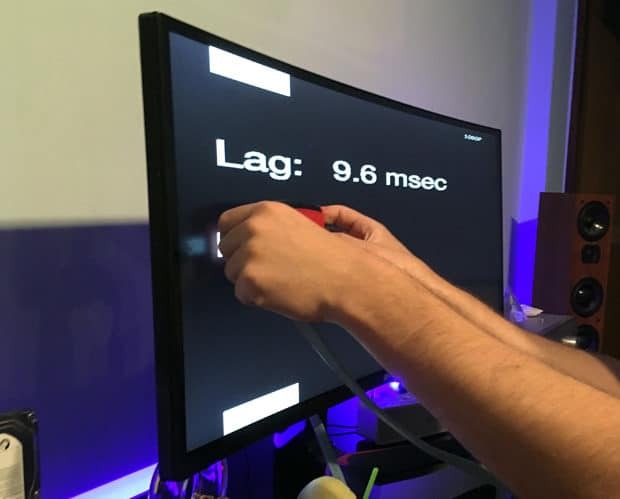 On/Off contrast is typical for IPS panel technology – we measured 1161:1 which is almost the same as on the previously tested Philips 245C monitor. 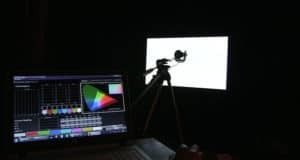 Without real local dimming, this means that the contrast of the picture is decent and will be enough for most users, but if you are after better contrast, monitors with VA panels achieve better result here. 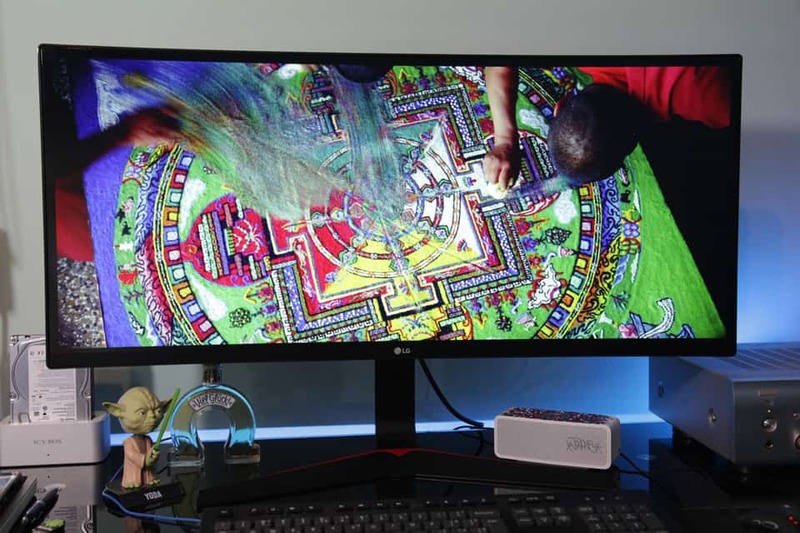 For example, AOC’s AG352QCX achieved 2723:1 contrast with deeper blacks. If you plan to use LG’s 34UC79G-B for tasks which require accurate image representation, I highly recommend performing a calibration. If you are buying this monitor primarily for gaming and do not care so much about color accuracy, then calibration is not mandatory as the picture is decent enough in Custom preset. Below are listed all conducted tests including On/Off contrast, panel and backlight uniformity, screen reflections, viewing angles, etc. At the end is score average that summarizes the performance of the tested monitor. 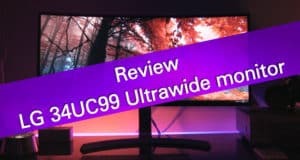 We tested 34UC79G-B for just a few days, but that was enough to get to know the product well and to see how it behaves in reality. We used the monitor to play games, to work on video editing, to write documents and for typical day to day activities such as surfing the web or managing documents and files. 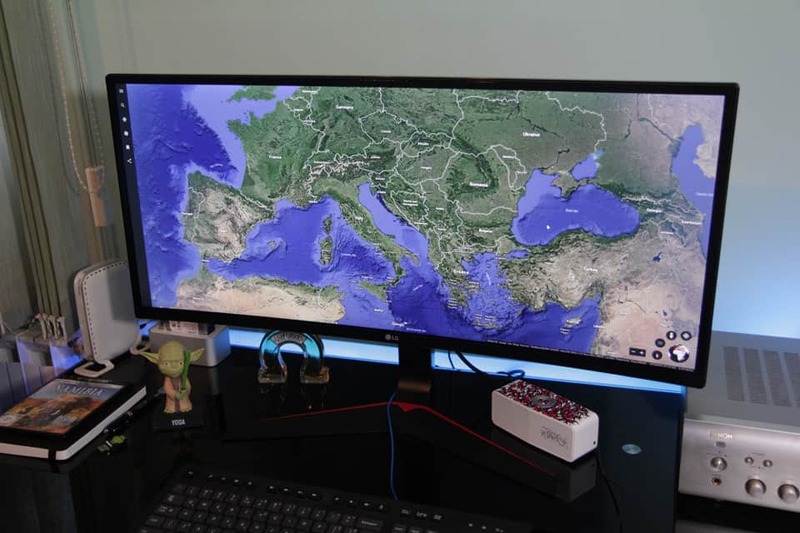 34UC79G-B was placed on the same desk where we use our 16:10 Dell 24″ 2408FPW monitor and it did not take us more than a few moments to completely forget about it and dive deep in the mesmerizing ultrawide screen. 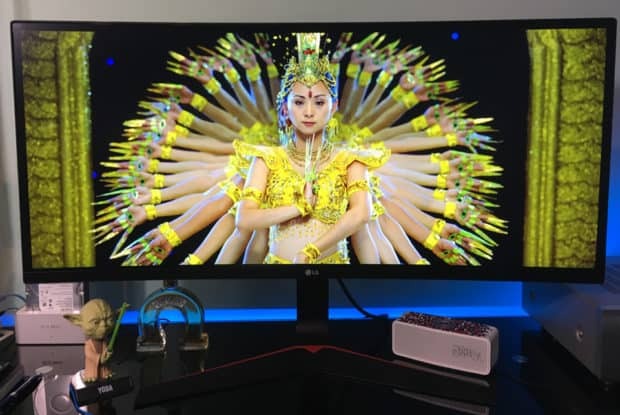 Since it has the same native resolution of 2560×1080 like AOC’s AG352QCX, 34UC79G-B is not the perfect example of a monitor with the truly sharp picture. Jagged edges on the letters and on icons and graphics can be seen from normal viewing distance, but on the other hand, everything is big enough to be easily legible. The author of this text usually increases text size in Windows from the usual 100% to avoid eyes getting tired too quickly, but in the case of this screen size and resolution, there was no need for adjustment. The resolution was high enough to split the screen into two halves and to use them for surfing the web on one side and having a document open on the other. Most office work often involves jumping from e-mail client to Word, Powerpoint or Excel and this way you can have both on one screen and easily manage this with higher efficiency. Even though you would be able to see more on a monitor with higher vertical resolution (e.g. 1200, 1440 or 2160 px), for most users 34UC79G-B will work great for office application and work in general. The picture itself, especially after calibration, is of reference quality and fully comparable with more expensive UltraWide monitors such as 34UC98 we tested a year ago. Colors are highly accurate and thanks to the IPS panel with a slight curvature, colors at the center of the screen and at its edges are of same saturation and tint. Despite being more accurately adjusted by default in sRGB mode, AOC’s AG352QCX was worse in terms of color uniformity across the screen. Watching Cinemascope movies on 21:9 screen is a great experience since there are no black bars above and below the screen (they might be very small depending on the actual source format). We were amazed by how well Ron Fricke’s Samsara looked even though there was a small amount of upscaling needed to fit 1920 content to 2560 screen. Dirty screen effect was almost none so it did not bother us while we were watching movies. For some reason we put gaming segment to the end of this segment, but that does not mean that was something wrong with it. 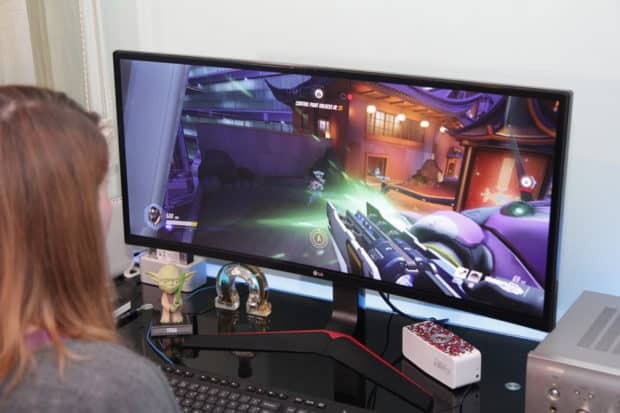 On the contrary, 34UC79G-B ticks all important boxes on the “perfect for gaming monitor” list since it combines high-quality AH-IPS panel with 144 Hz native refresh rate, low input lag and technology for reduction of screen tearing and improvement of motion resolution. Playing games was nothing short of amazing as colors were rendered beautifully, ghosting was not distracting and wide field of view has allowed us to be drawn into games. No screen tearing was detected during the test. Do not be tricked by “only 144 Hz” screen compared to “200 Hz” AOC’s AG352QCX – 34UC79G-B has cleaner motion, especially in dark scenes. Blur that exists is not distracting and very important it does not lead to very long trails as seen on above mentioned AOC’s monitor. 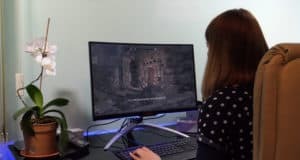 We enjoyed a lot of playing games such as Overwatch which natively support Ultrawide resolution but we also spent some time playing Starcraft 2 and Skyrim which were displayed with black bars on the sides. The monitor will correctly scale non-Ultrawide content and you can also adjust aspect ratio in user menus. Among the disadvantages, there is IPS glow effect which makes the black area of the screen to appear like it is silver, so you still need to sit directly in front of the screen or under small angle for the best result. All game modes have too high sharpness which you will need to manually adjust to get 1:1 pixel mapping without halo effect. 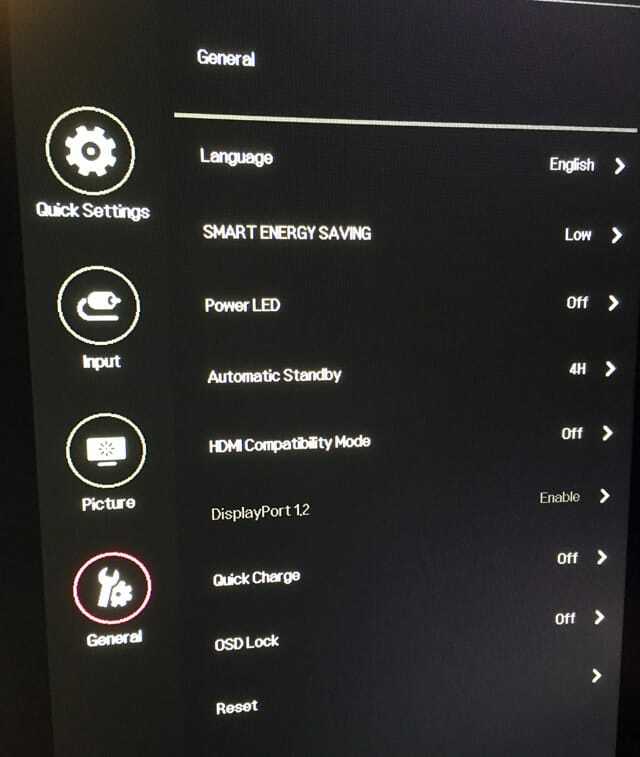 LG 34UC78-G does not have built-in speakers, so in order to get any sound coming through HDMI or DisplayPort connections, you need to connect headphones or speakers to the 3.5 mm audio out. The sound quality will depend on the quality of the connected device. Summary : LG has produced another excellent ultrawide monitor that will probably make its way to the desks of many gamers out there - or at least to their wish list. 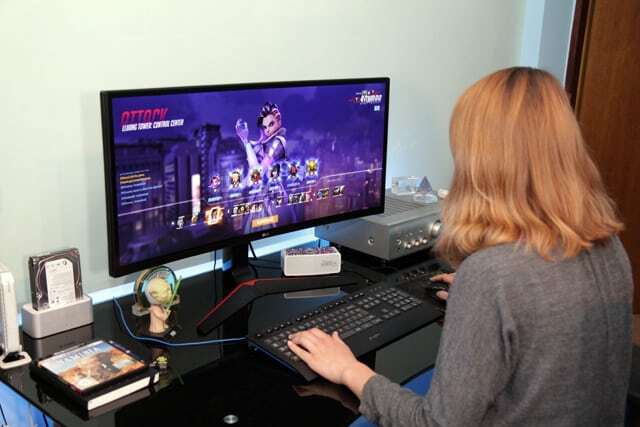 Great design and ergonomics, high quality IPS panel with native 144 Hz refresh rate, low input lag, game specific presets, blur reduction options and good picture calibration potential are its key advantages. Considering the price (€525 on Amazon DE or £480 on Amazon UK) and performance you get, this monitor receives our recommendation. 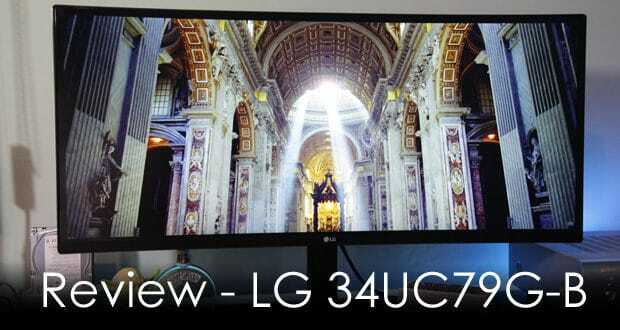 Review sample provided by LG Croatia. Founder of HD Televizija website. Certified ISF calibrator(Level II). Tech enthusiast since the 90s. Loves movie soundtracks. 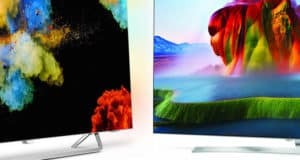 LG OLED TV analysis after 5000 hours of use – still great picture? Nakon iscrpnog proučavanje Web-a,ali i obaveznog štiva s Vaših recenzija,kao i uvijek iscrpne i detaljne analize,šaljem samo pohvale. Dakle,što se tiče potonjeg,jasno mi je što se tiče razlike u rezoluciji i da to treba pogoniti s pravim komponentama.Čak recimo da ih i imam.. I znam da će prikaz uvijek biti detaljniji na navedenom potonjem..Trenutačno imam R290oc koju namjeravam kroz godinu dana zamijeniti s novijom karticom isto tako iz High end ranga,kao što je bila iova u vrijeme svog izlaska..Procesor i7 7700K,Asus Maxiimus Hero IX matična,Corsair Vengence 3000 Mhz, 2×8 Gb memorija i Corsair RM 850i napajanje da budem točniji..
Ali kao gamer, i to većinom FPS-ova, (BF1,COD ,AC i slično)zanima me da li je Agon od 35 inča s 2560 x 1080 rezolucijom bolji od LG 34 UC79G ili gori,tj . LG je navodno malo tamniji što je više njih uzelo kao otegotnu okolnost..Ili je to samo subjektivan dojam onih koji igraju većinom u svijetlijim prostorijama..I da li je Vama osobno jedan od njih općenito dojmom zaokruženiji..
Osobno sam uvijek u prilično tamnoj prostoriji..
Ili ipak uložiti u budućnost sa pravim 2K ali 16:9 prikazom,te s kupnjom nove grafičke kartice pogonoti tu “težu” rezoluciju,ali i gledati multimediju u formatu koja je namijenjena i svakodnevno surfanje i ostale stvari osim game -anja koje bi mogle izgledati ” čudnije “,na gore navedenim ultrawide modelima? Znam da sam puno toga napisao,ali i nadam se dočarao otprilike pitanja koja me muče.. Thank you for and other exelent review. I ended up with this monitor and it is a really nice one, im still at default settings and would like to try your calibrated settings. do you happen to have the settings saved or and ICC profile that you could share?